India is a large, predominantly hot, country in south Asia, spanning latitudes between 8° to 33°N with the Tropic of Cancer passing through its middle. It is largely surrounded by the Indian Ocean with numerous topographical features like the Ganges River valley and the Himalayan mountains, all of which have an effect on its climate. India has different climatic regions, ranging from the glacial north, to desert in the west and the tropical coast and islands in the south. The country has four seasons – “winter” in January and February, summer between March and May, a monsoon wet season from June to December. The largely tropical weather patterns of India make it subject to natural meteorological critical events such as drought, cyclones and flooding. The dominant factor in India’s weather is the monsoon, which in India changes direction at different times of the year. Between June and October the rain-filled monsoon winds blow from the south west, drenching the sea-facing mountain slopes and bringing high humidity levels. Between December and February the wind direction switches to northerly, becoming lighter and drier, but therafter the heavy rains return from the south west, hitting the south of India with torrential downpours, spreading further north, until September. The Himalayan mountains in the north do not escape the monsoon rains, but because of the altitude the area is not as torridly hot and humid as are the more southerly regions of India. The effect of the monsoon decreases from across the north of the country from east to west, which is why New Delhi is far drier than Kolkata. The north-eastern desert region of Rajasthan is affected very little by the monsoon rains, making it hot and dry, with only light rain, for most of the year. The central plateau of India is cooler than the coast, with more moderate rainfall. The West coast (around Mumbai) is extremely hot, wet and humid during the south west monsoon season, but it is the south east coast that bears the brunt of the intensely hot and muggy monsoon conditions, which arrive later here, sometimes as tropical storms and cyclones. When is the best time to go to India? The winter months of December, January and February are regarded as the most pleasant time to visit India weather-wise, particularly for a beach holiday. These months bring slightly cooler and drier conditions than are the norm, but it is not a good time to head for the Himalayas, which are snowbound at this time of year. During most of the year the timing of a holiday in India depends largely on which region one is planning to visit. In the height of summer (March to May) for example, the mountains and hill stations are more bearable than the relentlessly hot, humid coastal areas. During monsoon season there is little escape from almost daily deluges of various intensity and duration in India, but the driest regions are Rajasthan, the Deccan Plateau to the east of the Western Ghats mountains, and Ladakh in the far north. With good footwear, sunscreen, hats and sunglasses the rest takes care of itself. Breathable trousers and short sleeved shirts are comfortable and modest (an important caveat for both men and women), light long sleeved shirts or lightweight trousers are good for most places at most time of year; comfortability is key. Many women choose to wear the local clothing, saris and such, for its comfortability and because it fits into the need for modesty. Wear fleece and warm jerseys, as well as long sleeved shirts for colder areas or times of year, and synthetic materials and rainwear for the rainy season. Comfortable walking sandals are essential, as are amphibian-walking shoes when travelling in the rainy season or for adventure travel. Upscale restaurants and establishments may often require smart clothes, but many people to choose to avoid these spots for a more 'authentic experience' of India. Carry basic medical supplies and a water bottle with enough fresh water for the day; insect repellent is a vital item. When travelling in wild areas, it is a good idea to have long sleeved shirts or second skins and trousers. Note: January is the coolest month of the year across India, with temperatures falling as one travels north, and to higher altitudes in the mountains and interior. The south coast remains very hot and humid. This is also a very dry month. The pleasant weather in India in January makes this a peak holiday season month. Note: A pleasant month for travel to India, February is warm and dry in most of the country’s regions. The only “no-go” area in this, the Indian winter, is the Himalayan mountains which are freezing and blanketed in ice and snow. The hottest weather is on the south-east coast. 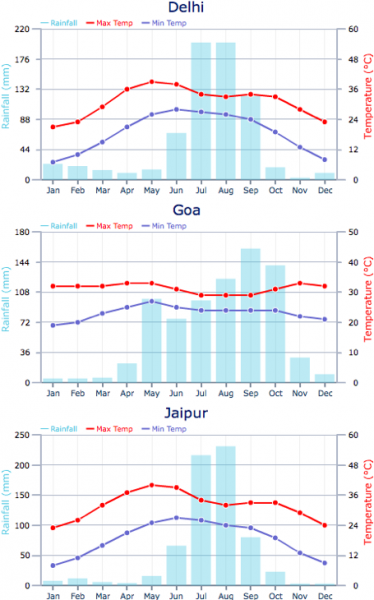 Note: March sees temperatures creep up generally across India, and conditions become very steamy. There is little rain during March, but the relentless heat makes travel in India uncomfortable at this time of year. Note: The monsoon season has yet to arrive, but the heat and humidity is increasing, with many places experiencing daily highs of over 40°C (105°F). It is somewhat cooler in the south of the country, although this is compensated by higher humidity levels so there is little relief during what is regarded as high summer in India. Note: During May in India the first signs of the approaching southwest monsoon become apparent, with building humidity levels and occasional thunderstorms. May is a good month for visiting the mountains and hill stations, where conditions are cooler and fresher. Note: The southwest monsoon blows in during June, making its way initially up India’s west coast, but bringing scant relief from the relentless heat. The first sign of the monsoon is frequent thunderstorms, and as the month wears on the downpours become longer and more intense. Note: The monsoon rains literally burst into India during July, spreading across most of the country, with localized flooding and muddy conditions often causing travel disruptions. The driest places in India in July are the Rajasthan desert and Ladakh in the far north. Note: Most of India is drenched in frequent downpours of monsoon rains during August. The intensity of the rain is heaviest in the west – Mumbai for example receives a monthly average of 617mm (24in) during July. The rain, coupled with the heat and humidity, make conditions in India uncomfortable in July. Note: Although the monsoon rains begin the tail off during the second half of September, it remains wet in the northern mountains and plains, and there is still plenty of rainstorm activity on the coast, in between sunny spells. Temperatures remain high, exacerbated by sticky humidity. Note: As the monsoon rains recede during October in India, so the beaches begin to fill up with sun-lovers as resorts prepare for the winter tourist season. It becomes cool to cold in the highlands and overall temperatures are more comfortable by the end of October. Note: An ideal month to travel to India, November is dry, sunny and comfortably warm during November. It is a good time to visit to avoid the peak tourist seasons of the coming few months. India’s far north, in the Himalayan region, becomes freezing in November. Note: Mid-winter in India means sunny skies and deliciously warm temperatures (especially in the south) over all but the frozen northern mountainous region of the country. Visitors flock to the beaches at resorts like Goa, and even the hot desert state of Rajasthan has bearable temperatures during December.